Optometrists are primary healthcare providers who specialize in the examination of people’s eyes to diagnose vision problems and diseases of the eyes. Optometrists test for a patient’s ability to focus and co-ordinate the eyes as well as for depth and colour perception. Optometrists differ from opticians who are licensed to dispense eyeglasses, contact lenses and other vision devices and ophthalmologists who are medical doctors specializing in all aspects of eye care. 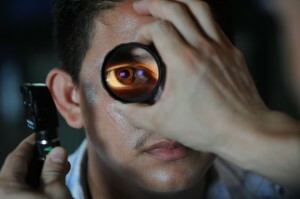 Optometrists examine patients’ eyes by any method (other than surgery) to diagnose abnormal conditions of the eye. They detect, manage and treat conditions such as job-related eye strain, age-related vision change, and disease. If necessary, optometrists prescribe corrective lenses that adjust the light rays entering the eye so their patients can see near and far objects with equal clarity. They may also provide vision therapy for those with vision problems or those who have recently had eye surgery. Optometrists also perform the visual diagnosis, prescribe lenses and design, verify, and fit spectacles to meet any specific functional requirements of a workplace. If, while examining a patient, an optometrist finds evidence of disease, such as diabetes or high blood pressure, he or she refers that patient to another healthcare practitioner. Optometrists require a minimum of five years of post-secondary education to obtain their professional designation, Doctor of Optometry (OD). There are two universities in Canada with programs in Optometry accredited by the Accreditation Council on Optometric Education: UniversitÃ© de MontrÃ©al and University of Waterloo. Upon completion of the four-year program in Optometry, licensure by the provincial or territorial governing body is required before a graduate can practise. This process includes a national examination administered by the Canadian Examiners in Optometry. A foreign-trained optometrist who wishes to practice in Canada needs three things: 1) a Doctor of Optometry degree from an accredited School of Optometry; 2) completion of the Canadian Standard Assessment in Optometry (CSAO) exam, which is administered by the Canadian Examiners in Optometry and Provincial Licensing Authorities; and 3) compliance with individual provincial licensing policies. Since provincial regulations vary, international practitioners interested in practising Optometry in Canada must contact provincial-licensing authorities directly. Applications to take the CSAO exam must be completed through these provincial offices. In Ontario, this is the College of Optometrists of Ontario . Most optometrists are in private practice and earn anywhere from $50,000 to well over $100,000 per year. Upon graduation most optometrists are employed as associates in an existing practice before buying in as partners, buying another practice or setting up a new practice. Others work in department and optical stores or hospitals. It is not uncommon for a new graduate to work part-time in two or more offices or stores. Most optometrists work in general practice, but some specialize in eye care for children, the elderly, sports vision or working with people who have partial sight. When optometrists go into private practice they can determine their own working hours. They usually work a five-day, 40-hour week, but some work evenings and weekends to accommodate patients. Emergency calls are rare. Some optometrists work for large manufacturing companies that make safety glasses and other vision-related products for various industries. Others do research in the visual sciences such as studying ways to reduce on-the-job eyestrain for workers. There are approximately 60 graduates per year from the University of Waterloo, the only English-speaking School of Optometry in Canada. Graduates of the program may face some employment competition in the larger urban centres but in other areas there is a shortage of qualified optometrists.